Through manufacturing mirin from Japanese rice, Sumiya Bunjiro Brewery Co., Ltd. will keep contributing to the greenery securement and the environmental preservation for Japan. The "greenery" around the living climate refers to the "greenery" of fields and paddies. The country views regenerated every year as a result of farmers' economic activities give peace and affluence to residents. However, if vegetables and rice harvested by farmers are not traded at fitting prices for the actual costs, their business will not work out. In order to preserve the greenery around your residences rather than the greenery of distant mountains or overseas farmlands, you should take part in the greenery preserving activities by buying agricultural products harvested around you. When you get concerned about farms and buy local products, it will help secure the "greenery" in your living environment and expand your comfortable living space. 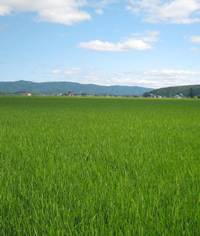 The environmental effects of the Japanese agriculture on the living environment should be positively recognized. Residents should positively participate in the preservation and development of the environment by buying local products. Furthermore, in order to make the environment more pleasant, both residents and farmers should strive for reducing the use of man-made chemicals (agricultural chemicals, chemical fertilizers) as much as possible. In order for us to ensure safe living environment for the future, we will continue to work hard to realize organic agriculture.